If you're making Bentonsport, Iowa your vacation destination or just passing through, we welcome you to stay for a while and visit one or two of our interesting attractions , such as the Bentonsport National Historic District Or perhaps your timing is just perfect to take part in an exciting event. We know you'll enjoy the . Browse Bentonsport's shoppes for gifts, good restaurants, and places to stay overnight. For outdoor fun go fishing or camping at a nearby lake or park, or just take a short day trip through our scenic countryside. We want your trip to be a memorable experience so you can tell all your friends, "Make sure to stop and visit Bentonsport, IA"
We are happy to provide you with a brief description of what Bentonsport, Iowa has to offer, but this isn't all! For more in-depth tourism and travel information such as sites and shopping, entertainment, events, lodging, real estate and more please contact us and let us know! 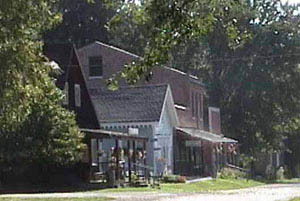 The Greef General Store was built of brick and stone in the early 1840's, it was once the largest store in the county, and housed the Greef brothers' banking operations.